Today there was a new banner on the Kop. It took pride of place in front of the pitch. If the TV cameras wanted to show it, they’d have had no trouble finding it. They didn’t bother. That was no surprise, but then neither was this display of solidarity with a veteran campaigner for social justice, Jeremy Corbyn, from a group of supporters who share his passion for fairness and truth. 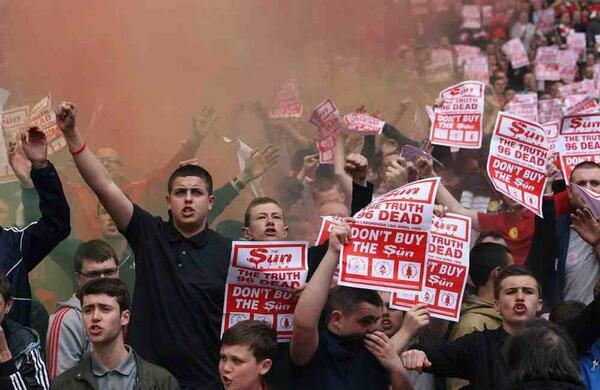 The local paper, the Liverpool Echo, ran a poll asking supporters whether they agreed with the banner. 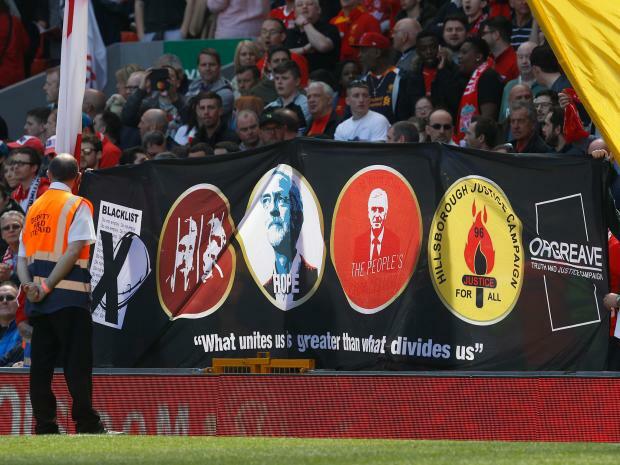 Nearly three quarters of those who voted said they’d be proud to see it on the Kop. I’ve been in love with Liverpool Football Club my whole life. In my childhood Anfield, despite its austere surroundings and primitive interior, was an almost mystical place, where acts of magic were regularly performed. The players were giants and the club’s managers, Shankly and Paisley were nothing short of deities. In the 70s that magic allowed me to see football as an escape. I had a decent childhood. My parents both worked and I can honestly say that, although we were far from well off, we never lacked the essentials in life; a roof over our heads and food on the table. I didn’t need the luxuries in life, because every other Saturday I was within walking distance from paradise. There was no place for politics in that world. Politics was London and men in suits who spoke with posh accents that said absolutely nothing to me. Back then Europe was that place where our players would go to win trophies. Then you grow up. You live through a couple of stadium disasters and see the people around you smeared and accused of the most heinous crimes imaginable. You read headlines written, not by a man, but some sort of sneering malevolence, wrapped in a pin striped suit and your eyes are opened. Fully opened. You realise that the people who told lies about you and everyone you know, those who covered up the truth and sought to place the blame for their crimes on the very people they had wronged, are the most corrupt of bedfellows. The police, the courts, the newspapers and the very government its self would sell you down the river, so long as they escaped accountability. Then you grow older still and you begin to realise that it’s not just your childhood escapism that they’ve taken. They’re threatening your future too. All around you the place where you grew up, went to school, worked and played is falling apart. You see others locked in the same struggle to simply live a decent life. Nothing fancy, just the right to work and pay the bills and maybe have a few bob over to go the match or take the kids on holiday. But you have to battle and scrimp and save to do even those things. Then you fight back. You realise the odds are overwhelming, but you have all these people around you, who feel the same way. You’re never going to walk alone, no matter how long it takes. They’ve picked on the wrong city you say, through gritted teeth. Then you win. After all the set backs, the times they kicked you when you were down, you never gave in. You withstood it all, because you knew you were right. All your mates knew it too and in the final analysis, we were the many and they were the few. They never stood a chance. Through all of that I’m struck by how it’s all so inter-connected. The right to work, rest and play, to enjoy watching your favourite team in safety, it’s all part of the same struggle. None of it is too much to ask for, but it’s others who decide whether we get to enjoy any of these things at all. That’s probably why Scouse working class lads like Robbie Fowler and Steve McManaman showed solidarity with striking dock workers in the 1990s. It may be why Jamie Carragher tweeted “Vote Labour” recently. It’s because they too see how those on the pitch and those in the stands are intricately woven together. As Shankly said, we are all part of a great society and we all deserve to share in the rewards of our labours at the end of the day. Football is political. Life is political. In reality our whole lives, birth, life, marriage and death are affected, for good or ill, by politics and the actions of politicians. So it comes as no surprise and fills my heart with immense pride, to see Kopites unfurling a banner in honour of Jeremy Corbyn. He is, after all, a man who has spent his whole life fighting to shift the balance of power over all of these things, from the establishment to the people. Like Jeremy, the people of Liverpool don’t know the meaning of the phrase ‘lost cause’. We do understand the power of solidarity though. We know that the road to victory can sometimes be a long one, but there is always great strength in unity. In the end it’s always preferable to fight for your principles and risk losing, than to capitulate and face certain defeat. Jeremy Corbyn may be an Arsenal fan, but he’s an honorary Kopite now. Brilliant article. It was about the politics of life without being hackishly political. I can completely relate to how the magic of the match remains even if the mystery of it and the ground fades as we grow older. But we can start to ask questions of it and about it. Me dad could rarely afford to take us both in the stands in the 1970s and I never understood why. God knows how hard it must be for most working class dads today. The Echo has thrived on football down the years. The click bait headline in The Echo about the banner was pathetic. But ever was the paper conservative with a small ‘c’. Like most regional papers it’s run by the middle class for a mass audience. The Echo was appalling politically in the 1980s. I can’t stand it’s gossip and trivia. But I digress, why doesn’t SOS do more around overtly political stuff? Why don’t we have a political grouping of lefty ultras like other clubs are? Might help getmake the atmosphere bettter god knows it’s been rubbish for years.